The term ‘less is more’ easily reflects today’s new home construction trends. Less energy used, less water consumed, less pollutants in the home, and less money going out on a monthly basis means more (and easier) living for our Eppright clients. So what are new home buyers looking for to make their lives easier and friendlier for the environment when they build? One of the fastest growing trends in new home construction is automation. With technology becoming ever more prevalent in our everyday lives, there is no end in sight to what smart homes mean to us. This is especially true when you build a custom home. Homes are now being controlled with the touch of a button and even remotely. Actions like turning up or down the air conditioning, lowering or raising your blinds, and seeing who is at the front door while you’re cooking in the kitchen are just some of the amazing features that can be included in your custom home. Today’s savvy home buyers are aware of what building a new home means to the environment, and their wallets. With those issues in mind, green features are becoming more popular. Energy Star appliances are now the norm. There are ever increasing options for energy efficient building materials; water conserving bathroom and kitchen fixtures; and eco-friendly landscaping. Home buyers are even concerned with indoor air quality as well. Aside from hepa (high efficiency particulate air) filtration systems, many finishing products include low- or no-VOC (volatile organic compound) flooring and paint. 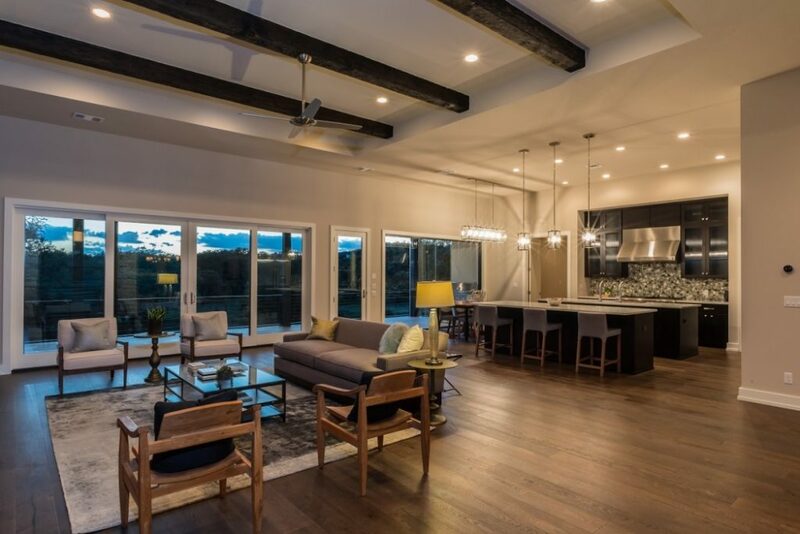 Bright homes encompass all elements of design from paint and cabinets in kitchens and baths, to walls of windows and skylights that provide an abundance of natural light. Crisper, lighter finishes work symbiotically with the clean lines and open floor plans today’s new homes. At Eppright Homes, we’ve found that many of our custom home clients lean towards cleaner lines and sleeker finishes; especially in their kitchens. Clean homes also fall in line with open floor plans. With a wide opens space, furnishings are minimal providing clean sight lines from one living space to another. Bathrooms follow a similar pattern, engaging open glass showers and large-format tile floors.